Spring fishing was patchy this week, with several fish being caught on some days and none on others. Water conditions are perfect for flyfishing, and all the fish caught this week were taken on the fly. Looking over the bridge on Tuesday while going for a lunchtime walk, I spotted three nice springers hanging in the current, so they are there alright, it's just a matter of tempting them! Among the anglers to score this week were Dublin angler Steve Jones, who landed a nice 9.5lbs fish on fly. Sunday was a good day, with 3 fish caught, including early grilse for Northern Ireland angler Paul Stewart and midlands visitor Padraic Corrigan, who both released their fish caught on fly. Paul O'Malley, also from the midlands, landed a nice 8lbs spring fish, also on the fly. On Tuesday Jasper and Louis Mathews from Cleggan enjoyed a fine day flyfishing, with Jasper catching and releasing a 6lbs fish, while Louis landed a fine 11lbs springer, which he tried to release but the fish was bleeding too heavily. Finally, Gort angler Colman Counihan had a lovely 13lbs salmon on the fly on Wednesday evening on his first run down the beat. Fresh fish are in the river, and conditions are excellent for the fly, with one gate open, giving anglers great hope for success in the coming weeks. Ronan Cusack reports superb fishing on Lough Mask again this week despite strong easterly winds over the weekend. Ballinrobe and District Anglers held the annual David Walsh Memorial Development 2 day competition on Saturday/Sunday, which was supported by 80 anglers from across the country. This year's winners were Ronnie Law from Fermanagh and Trevor Goulden from Sligo. The lads had a total of 12 trout for 16.33lbs. John Lyons and Martin Connors took second place with 12 trout for 14.52 lbs and Hugh O'Reilly and David Connors were in third position with 10 trout for 13.33lbs. David Connors also won the best Ballinrobe angler prize. Eamon Ross from Co Cavan took the heaviest fish prize with a trout of 2.70lbs. 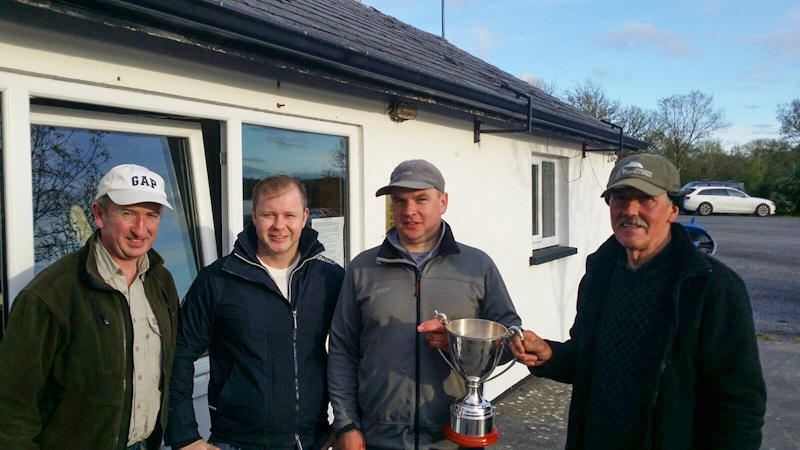 Ballinrobe anglers Chairman Kevin Egan and JJ Walsh present the David Walsh Cup to the winning team of Trevor Goulding and Ronnie Law. 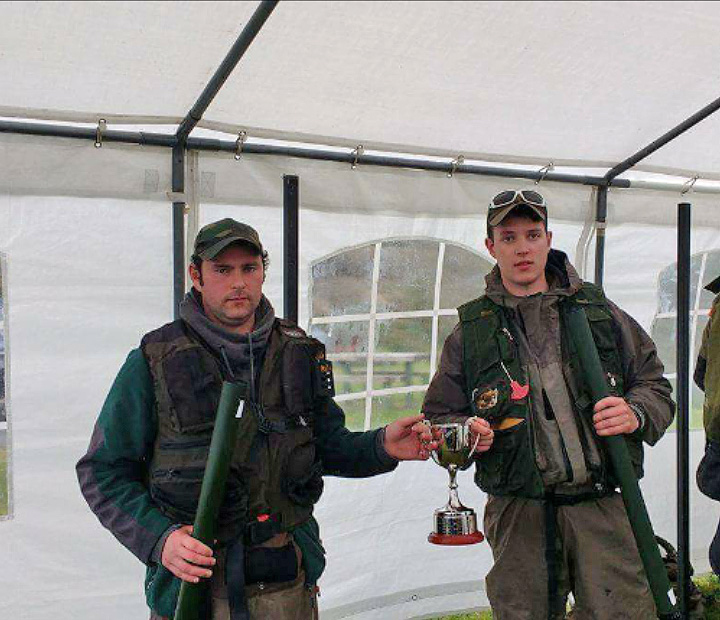 25 members of the Westport Angling Club weighed in 33 trout in a competition on Sunday last in very rough conditions. In first place was Dave Duffy with 3 trout for 5.0lbs. Second went to Jason Sweet with 2 trout for 4.50lbs and in third place was Toby Gibbons with 3 trout for 4.50lbs. Jason took second prize as one of his trout was 3.5lbs. Clare anglers Dave Egan and Brian Madden fished with David Connors from Armagh on Monday last and they finished with 13 trout, mainly on olive patterns (best fish 3lbs). Eddie Rowe from Dublin had a lovely 3lbs fish on a dry olive while fishing in flat conditions with Mark Rogan on Monday last. Michael McDermott from Castlerea had 3 nice fish on Monday pulling wets (best fish 2.bs). Derek Madden also from Castlerea had 3 trout on buzzer on Monday (best fish 3lbs). Eddie Rowe with a lovely 3lbs Mask trout caught in calm conditions, 1 May 2017. At the moment on Mask, there are plenty of olives and a sprinkle of mayfly to keep trout interested and looking upwards. Mark Rogan heads out on Costa Del Mask for a day last Monday. 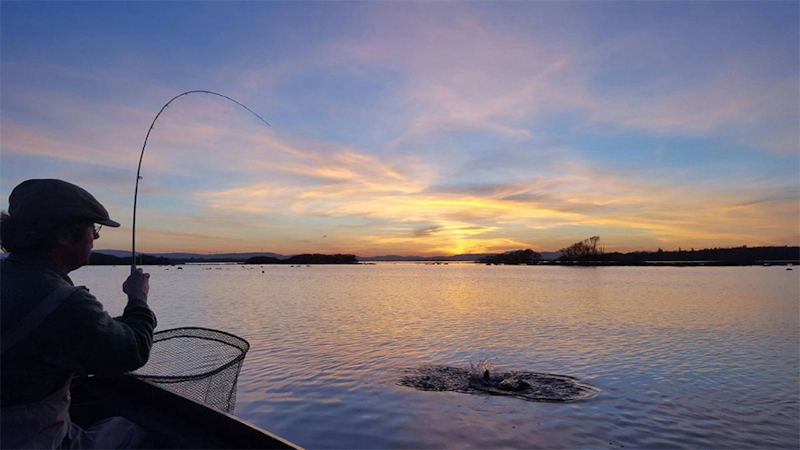 Declan Gibbons reports that the rise in temperatures saw greater numbers of fish caught due to better hatches with fish being taken on buzzer, olives and mayfly. Mayfly hatches are getting going in most areas, as the whitethorn trees begin to blossom. 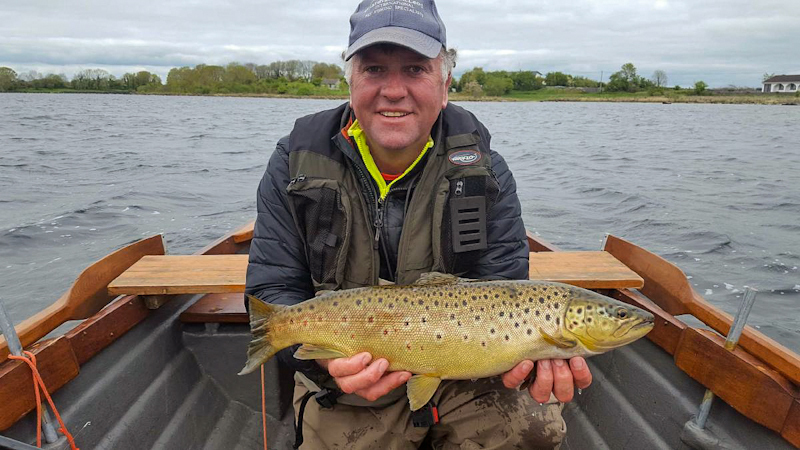 Larry McCarthy from Corrib View Lodge, Glencorrib (www.corribangling.com) reports a mixed week with Baltic conditions on Monday and Tuesday but good fishing for the remainder of the week. Tim Rowley and John Warmsly from the UK had 8 fish for 4 days on buzzer including 2 over 4lbs. Tom Chamberlain and Richard Watters, also from the UK had 17 trout for 4 days, all on deep nymphs - best fish over 4lbs, all returned. Owein Meeling and Nick Meesham had 5 fish for 3 days on buzzer, all returned. With better temperatures and light winds forecast for the week Larry is expecting an exciting week ahead at Corrib View Lodge. 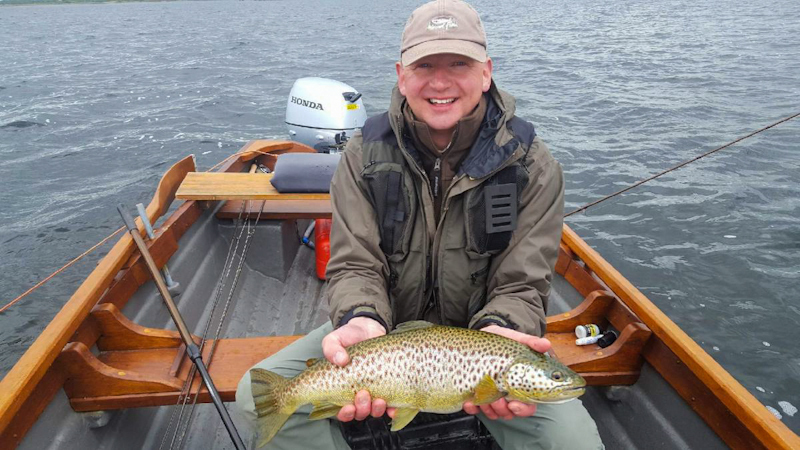 John Warmsly, UK with a lovely Corrib brown trout caught during his visit. Ted Wherry from Mayfly Lodge Ballynalty (087-4305957) reports on 3 days fishing in the area which produced 10 fish while guiding Richard Robinson, best fish being 3lbs on dry and wet olives. Mick Hill enjoyed a day's fishing on the lower lake and land himself a cracking trout of 4.25lbs. Richard Robinson enjoyed some good fishing to wet and dry olive patterns during his visit with Ted Wherry, including this beautifully patterned trout. 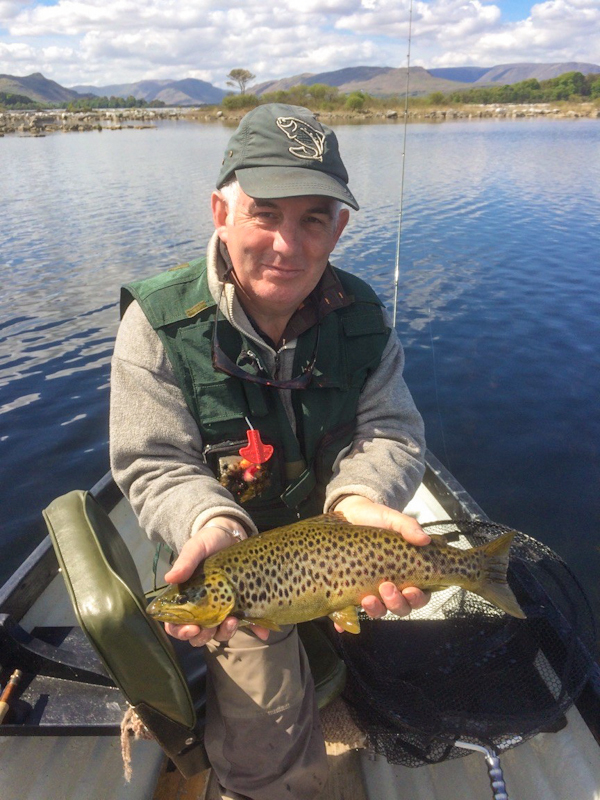 Basil Shields at Ardnasillagh Lodge ( 091-552550 ) in Oughterard reported a more productive week with most fish caught on buzzer and some on mayfly. Steve Sutton, Les Nicholson, Neville Thompson, Shane Cullen and Rob McCabe, visiting from Dublin, all had fish between 35 and 50cm on buzzer, all sportingly measured and released. 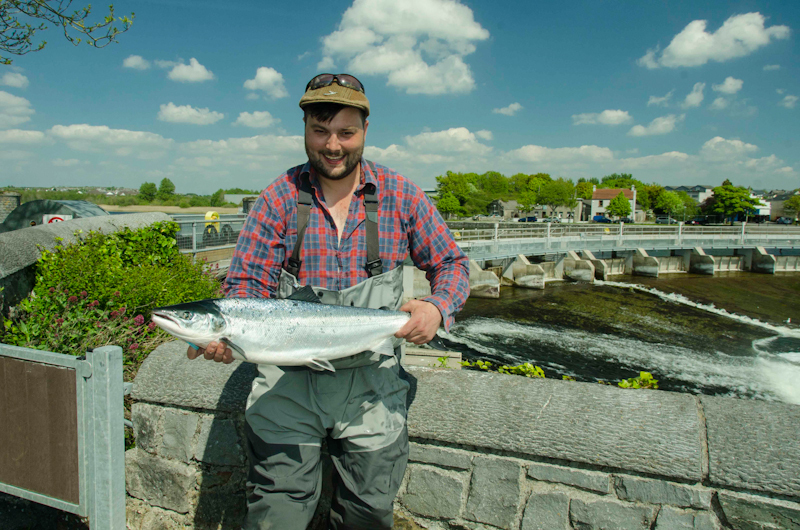 Bill Church had 2 fish for his visit to Lough Corrib on buzzer - best fish 5.5lbs. Declan Murphy enjoyed 2 days fishing with Basil on Wednesday and Thursday last and had 6 fish for his 2 days, all on buzzer - best fish 2.25lbs. Colman Counihan had 2 fish on Friday last with the best being 3.25lbs, also on buzzer. Ulrich Cronin had an excellent day at the lodge, landing 6 fish, all on buzzer with the best fish 3.75lbs. Joe Barry had 3 fish for his visit to 3.5lbs. On Sunday last Bill Flynn had 6 fish on mayfly and Joe Barry had 3 fish, also on mayfly. Joe Finch had one fish on buzzer on Sunday for 3lbs. 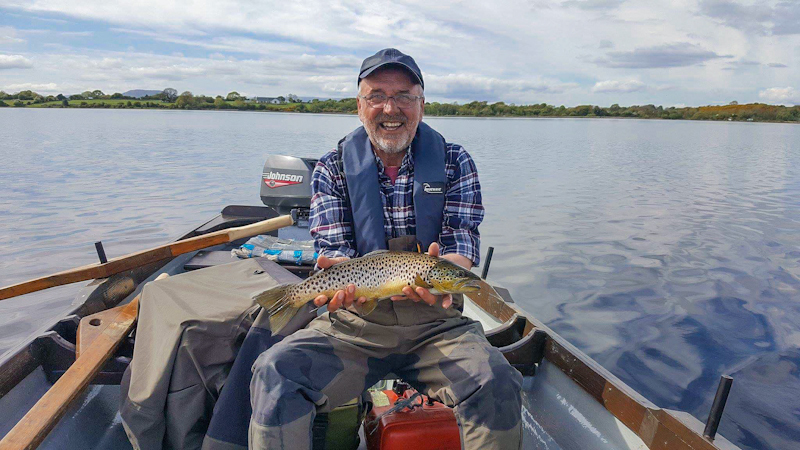 Staying in the Oughterard area Kevin Molloy of Baurisheen Bay Boat Hire, Guiding & Self Catering ( 087-9604170) was out on Friday last and landed 5 trout - 2 on buzzer and 3 to wet fly, with the best fish being 3lbs, and on Sunday last Kevin and his brother Eamon landed 8 trout to 3.5lbs on a mixture of buzzer and wets. In the Cornamona area the Cornamona & District Anglers hosted their Annual Catch & Release Charity Competition on Sunday, which saw the proceeds going to the Galway Hospice Foundation. 48 anglers participated in the competition with 121 fish recorded, all measured and released. The event, which was a team competition was won by Cong duo Barry Molloy and Mark Gibbons, with 11 fish. 2nd Place went to Gerry Dixon, Oughterard and TJ Carroll, Westport with 10 fish. 3rd place went to John Lydon, Cong & Robert Holian, Cross with 10 fish. The Longest Fish prize went to Jimmy Molloy, Cong with a fish of 52cm. It is worth noting that 75% of the fish recorded were over the 13 inch legal limit with the other 25% between 30 and 34 cm. Barry Molloy and Mark Gibbons, winners of the Cornamona Anglers Hospice Competition, 2017. Staying in the Cornamona area Richard Molloy of Ballard Shore Boat Hire & Self Catering (087-2879339) says Tom Ormond and Mike Hegarty enjoyed a day's fishing last Friday, with Tom landing one nice trout and Mike landing two on wet flies - best fish just over 2lbs. 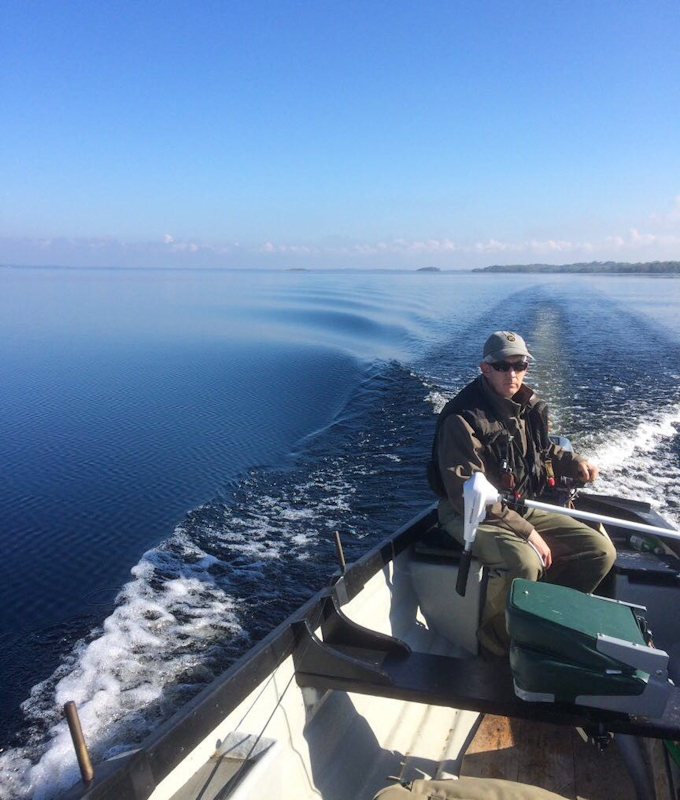 Also in the Cornamona area on Thursday last John Somerville and Stephen Lydon were out on Corrib and boated 3 fish to 3lbs on buzzer, and on Friday John was out for two hours and had two up to 2lbs, also on buzzer. John is available for guiding and can be contacted on 087-7509478. On Saturday last TAFI hosted the Connacht Cup out of Greenfields, with Gerry Dixon being best Individual Rod on the day and the best team on the day went to the Westport team. Good fishing was reported for the competition that was run on a Catch & Release basis.